Jomo went on to graduate from Cody, earn certification in marketing and advertising, have three beautiful daughters, graduate from the ProsperUs Detroit business training program at GRDC, and work at a number of places where he honed his ability to manage people, events, and large-scale projects. 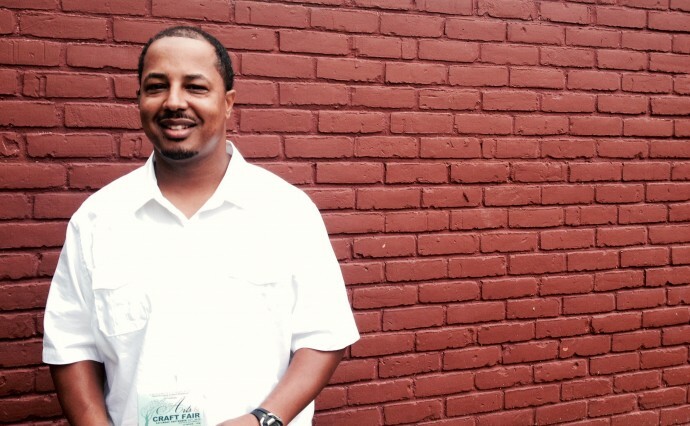 In 2008 Jomo bought a home in Grandmont and began to use his people and organizational skills in his own neighborhood. As a resident of Grandmont who wanted to get involved in his community, Jomo attended the Grandmont Arts and Craft Fair and took notes. He paid attention to what kinds of artists and vendors came, which ones were successful, the effectiveness of the venue, the size and type of crowd who attended the fair, and then he thought about ways to make the fair even better. This year, the 34th year of Grandmont’s Arts and Craft Fair, Jomo is putting his ideas to work. As director of the Art Fair and as a board member of the Grandmont Community Association, Jomo would like nothing more than to see all kinds of people come to participate in, and enjoy the Grandmont Arts and Craft Fair. One of the biggest changes you will see at this year’s Art Fair is its new location in Ramsay Park. According to Jomo, the park offers “a more intimate setting for the vendors and the attendees and it won’t be an inconvenience to traffic”. Jomo is also hoping to host more artists, more performing artists, and even more interactive demonstrations for fair goers. This year’s Art Fair will also feature local painter Ron Scarborough, whose work hangs in the Charles H. Wright Museum of African American History. There will also be a Kids’ Corner where kids can get their faces painted or try out creating some art work of their own. Jomo expects 300-400 people at the Grandmont Arts and Craft Fair. Those lucky enough to attend will be able to experience not just a terrific Art Fair in a terrific neighborhood, but they will also be contributing to a scholarship fund for qualifying graduating high school students from Grandmont. For years the Grandmont community has offered its young adults a helping hand in paying for their college education. The Arts and Craft Fair is one of the scholarship’s biggest fundraisers and an impressive expression of the power of community. Jomo recognizes this emphasis and agrees: “The Art Fair is a community oriented event in conjunction with the arts.” Just as he bridged the gap between the kids from all the different middle schools when he entered high school, Jomo would like to see people from all over come to Grandmont to enjoy the Art Fair. 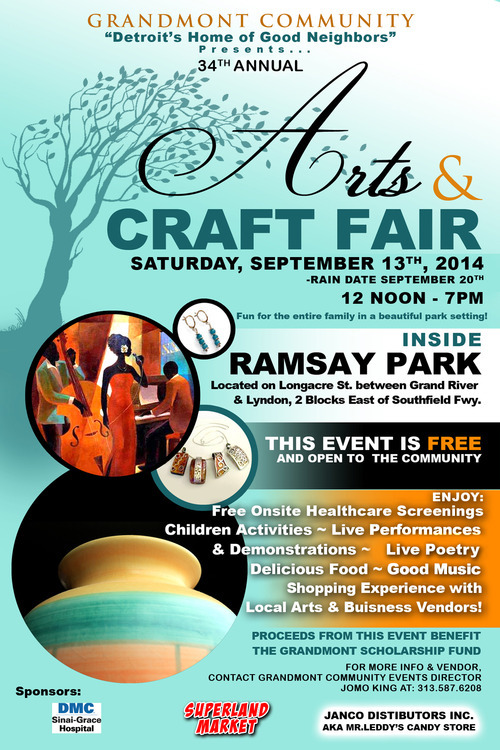 The Grandmont Arts and Craft Fair is free and will be on Saturday, Sept. 13 from 12 – 7pm at Ramsay Park (on Longacre between Grand River and Ray Monnier Drive). The rain date is Sept. 20. If you would like to be a vendor at the Art Fair, contact Jomo King at jkinggrandmont@gamil.com or 313-587-6208 to fill out an application by Sept. 5. Come on out to the Art Fair and look for Jomo. He’ll be the guy who seems to know everyone.